CHICAGO, IL — SpotMe, the global technology provider of enterprise engagement platforms, has been named a BI WORLDWIDE Inspirational Partner for the second year in a row. 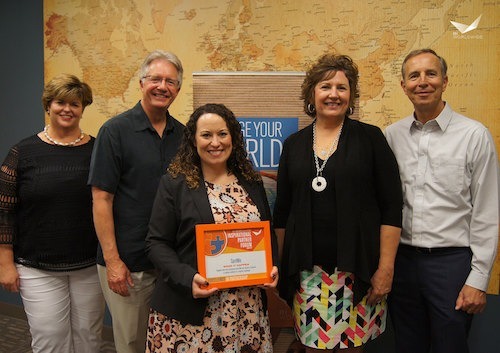 SpotMe was honored to receive the award in the category of “Make it Happen”: a supplier who best partnered with BIW and clients to address logistical challenges with a creative solution. This designation aligns SpotMe with other companies who maintain a loyal partnership and provide top-notch service in the event industry. “We’re proud to honor SpotMe as an Inspirational Partner. Their high standards and attention to detail help us deliver the excellent service our clients deserve. We look forward to continuing our partnership,” said Mary MacGregor, Vice President of Event Solutions at BI WORLDWIDE. SpotMe and BI WORLDWIDE have partnered together for almost three years delivering events to multiple clients. SpotMe’s record of cutting-edge technology, combined with the Company’s award-winning service, has led to BI WORLDWIDE’s recognition. “With SpotMe’s partnership and support, our app sales doubled in the past year and the degree of sophistication has significantly heightened,” said Abbe Coen, Design Manager of Event Technology at BI WORLDWIDE. BI WORLDWIDE’s Inspirational Partners Forum is designed to bring key supplier partners together for education, and information exchange. These key suppliers are a vital component to achieving excellence and BI WORLDWIDE is honored to recognize Inspirational Partners across six categories: Make it Happen, Show Me the Money, Keep in Touch, Turned it Around, Creative Touches and Excellence in Operations.